A friend invited me to a restaurant in Sausalito recently. Thinking about the drive across the Golden Gate Bridge to Marin County brought back many bittersweet memories of wonderful and tragic days in San Francisco's seismic history. I used to work at KQED, first in TV programming, then in FM, over several years in the City. Before KQED moved to it's present Potrero Hill location, we used to have our studios and offices near the overpass at 8th and Bryant, South of Market, at the edge of the Tenderloin. 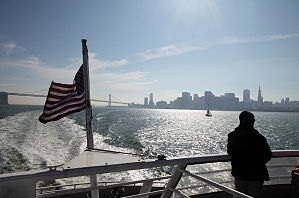 After disembarking from the Larkspur Golden Gate Ferry, our regular MUNI driver crooned soft pop and jazz as we moved South down Market Street through the Financial District from the Ferry Terminal. Regular riders brought him fresh morning coffee from the ferry's refreshment bar and we knew him by name. His voice sounded just like Lou Rawls and it was a great way to travel in the City. Every morning I had hot tea, a muffin, and read a newspaper with other City-bound commuters on the ferry. With the breathtaking early morning and late afternoon views, I believed then that I had possibly the best commute of anyone on the planet. That all changed on October 17, 1989, at 5:04 p.m.
During the opening practice before Game 3 of the 1989 World Series, which was scheduled to begin at 5:35 p.m. (an amazing Bay Area event with both the A's and the Giant's meeting at Candlestick that night), I was under Market Street on BART, heading to the ferry terminal for my ferry ride back to Larkspur. My husband was waiting for me at home in Marin, after cooking us dinner so we could watch the game when I got home. I had ridden MUNI and the Market Street BART line for several years and knew every turn and bump in the route. But that night the BART car did a small side-to-side sway, went up and down suddenly, then we came to a slow stop after leaving the Montgomery Street Station. Next, the emergency lights came on and I saw startled faces in the soft amber glow. It was completely silent, eerie, and all conversations stopped as we sat underground. I had been reading a newly-published book on the life and death of Chairman Mao. The chapter I had just started was discussing the construction of his mausoleum. I decided not to read that chapter at that particular time, as I did not want to tempt the fates. One woman on my BART car had three small children, did not speak English, and I could tell she was starting to panic. Many of the passengers were trying to get the Series game or news on transistor radios (having brought them to work for the ride home, knowing the series would start early), or to read their papers as if nothing had happened. Yet, when I looked at their faces, I noticed that most were glancing rapidly at the doors and windows of the BART car and not really looking at the open newspapers in front of them. Our BART driver announced that he lost communication with anyone outside and had no idea what happened or why we were stopped. He (gratefully) made the decision to evacuate us, since we had only 5 minutes of emergency power remaining before we would be stranded underground in the dark. I remember walking up the station stairs leading out of the Montgomery Street BART Station and emerging on Market Street. Seeing daylight again was incredibly comforting and such a relief. There were long lines of men and women in the black or navy suits so common in the Financial District, who were trying to make calls home at the overloaded phone kiosks. 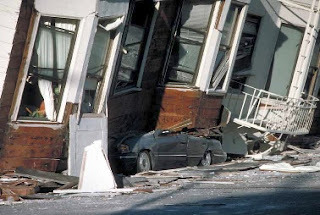 Others were standing far away from the shattered glass and rubble lining the sidewalks along the buildings, since San Franciscans are well-versed about the likelihood of aftershocks and falling debris from historic brickwork. A young man rode a bicycle down Market Street yelling, "The Bay Bridge is down! The Bay Bridge is down!" I was angry, believing he was trying to scare people. I learned later that what he said was partially true. One of my KQED Channel 9 co-workers had a neighbor who was killed in the UCSF van which had been caught under the collapsed Cypress structure. The commuter van had exited from the Bay Bridge heading South towards Oakland and Alameda, when the old overpass collapsed crushing the van and its occupants. Another KQED television co-worker thought she lost her husband on the Bay Bridge when she learned a section of that bridge had collapsed. Likewise, her husband worried that he had lost her in the same bridge failure, since they were both traveling back to the East Bay from San Francisco in separate cars. After some harrowing minutes on the shifting bridge, my co-worker was flagged by emergency workers, told to turn around, and motioned to drive back over the West span of the Bay Bridge back to SF in the Eastbound lanes, as the Bay Bridge was shut down by emergency workers. (She and her husband moved out of state within a few months of the Loma Prieta, not wanting to experience another California earthquake.) Similarly, one of our television producers was on the Golden Gate Bridge coming in from Marin, when all of the cars stopped in the middle of the bridge to wait out the shaking and rolling as the Loma Prieta hit. The Larkspur Golden Gate ferries had to be diverted to a different pier in order to dock and load in San Francisco, since the electric ramps could not be lowered to allow passengers to board. There were planks of plywood balanced between the side of the pier and the ferry, directly over the water. Passengers hopped across the tilted planks to get on board as ferry workers grabbed their arms to steady them. Passengers threw $20 bills, entire ferry ticket booklets, and any other cash they had on hand into into large, clean garbage cans held by ferry workers. As I recall, no one was turned away and many people paid for complete strangers to ferry out of the City that night, if they had no cash with them. We could see the Marina District fires burning in the distance when we were about midway across the Bay. The orange smoke reflected on the water created an unearthly glow and the City seemed unreal as the haze of smoke moved East and created an unnatural twilight over the familiar skyline. Many of us were relieved to see that the Golden Gate Bridge had survived, although we learned it was closed for inspection. The Ferry workers gave us updated news over their announcement system, since most on board had no access to news or radio reports. We learned that the Bay Area had just experienced a 7.1 magnitude quake from someone who had a transistor radio sitting near us in the ferry lounge area. A Goodyear Blimp which had been covering the World Series at Candlestick Park was used to coordinate emergency efforts soon after the quake hit. 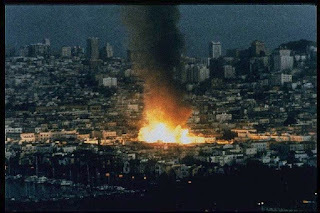 Since all of the major networks were at Candlestick waiting to cover the World Series game and doing pregame commentary live, the Loma Prieta shaking and aftershocks at Candlestick were caught on camera and documented worldwide. 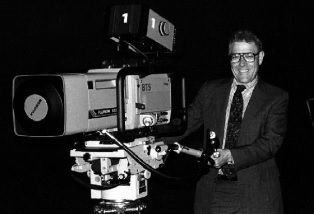 Many broadcasters and reporters were from the East Coast or out-of-state and had never experienced seismic activity in California before. As I and many others on the crowded ferry motored out of SF, the ferry bar did a booming business. I found some of my Marin neighbors and friends from other non-profits who also worked in the City. People bought each other wine and beer and gathered in small groups, grasping at a new sense of safety from finding those they knew on board. A ferry crew member I recognized told me that they were on the way to Larkspur earlier and thought they had dropped an anchor in the middle of the Bay as the Loma Prieta hit. To be safe, they returned the ferry loaded with passengers to SF, where they learned they could not dock. Fortunately, they devised the plywood plank system, so they were able to load new passengers on board along with the previous passengers, and transport us all out of the City to Larkspur. There were many people from the East Bay who fled to Larkspur by ferry that night, since they had no other way to get back to Alameda County. 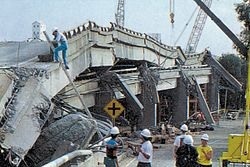 My husband and I offered to drive one man across the Richmond Bridge back to his home, but he declined, not wanting to cross over any bridges while the aftershocks kept coming. He called his wife, got a cab, and found a hotel in Marin for the night. I was particularly concerned about my co-workers and those in FM whom I knew would be covering the quake live. At that time KQED was a bit smaller, somewhat informal, and we enjoyed a tightly-knit community at work. For many years employees donated Thanksgiving turkeys, money and food to Project Open Hand, and in return they would roast a few turkeys for our staff's Thanksgiving potluck. Since we had many staff members from different cultures, employees brought dishes from their heritage, and it was a really wonderful gathering every year. Managers, administrators, and production personnel all mingled during this annual event, asking about our kids, families and holiday plans. As I drove home from the Larkspur Ferry Terminal that night, I listened to reports on KQED-FM 88.5, hearing the familiar voices of my colleagues and friends, hoping they remained safe as the aftershocks continued. 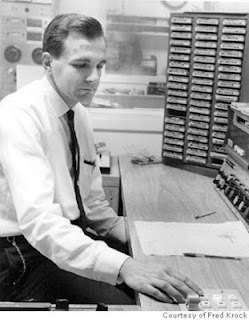 At home it was reassuring to hear the Channel 9 announcers I worked with every day still making live announcements from the broadcast logs, as it meant that the station was still intact and the generators were working in our old building. Many were off work for a few days if their buildings had been hit or power was out. Because I rode the ferry, I was able to work at KQED which had its own generator. However, I rode MUNI up and down Market Street for the rest of my career, no longer willing to get back on BART or to travel underground again. Bill Graham hosted a series of Earthquake Relief concerts at various venues around the Bay Area. 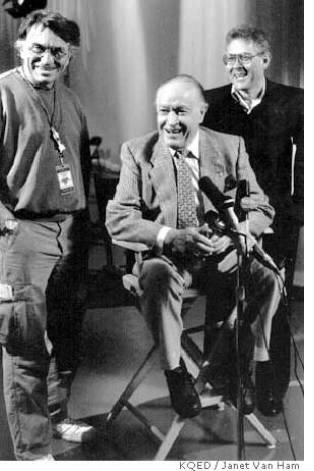 Graham flew Bob Hope to each concert site by helicopter, so he could welcome the large crowds who turned out to raise money and enjoy major name acts like Carlos Santana, Neil Young. Bonnie Raitt, Crosby, Stills and Nash, Pete Escovedo, Bobby McFerrin, Taj Mahal, and Los Lobos. When one of our KQED staff members asked the then 86-year-old Hope if he was ever planning to visit the troops again, Hope replied, "Son, the only battles I visit at my age are those on the golf course." He joked that he was a survivor of the 1971, 6.6 magnitude San Fernando Valley Earthquake, where he "got up and ran around the house and then the house got up and ran around me." Earthquake Relief and Bill Graham raised over $2 Million dollars from 22,300 people who attended concerts in Watsonville, Oakland, and San Francisco, as well as donors to the live telethon broadcast on KQED Channel 9. Mayor Willie Brown offered viewers a matching grant of $50,000 from his re-election campaign. The entertainers and their generosity were a catalyst in healing the Bay Area, Santa Cruz, and Watsonville. It was the first time in 35 years that KQED was given a waiver by the FCC to raise money for an entity other than itself, so it could broadcast the Earthquake Relief fundraiser live from 8th and Bryant. Back in Santa Clara Valley, St. Joseph's Seminary lost one resident when an historic tower collapsed. Around the Bay Area and down the coast to Watsonville, many residents lived and slept outside their homes during the 51 aftershocks which followed over the next 24 hours. Some of the aftershocks were real jolts at 3.0 magnitude. Residents had no idea how long aftershocks might continue or how powerful the jolts might be. Every aftershock could further weaken already compromised structures. The Loma Prieta epicenter was located in the Forest of Nicene Marks, 2 miles North of Aptos. It had a devastating impact on San Francisco's Marina District, since much of the Northern part of the City had been built on landfill over marshy areas that were once part of San Francisco Bay and subject to soil liquifaction. 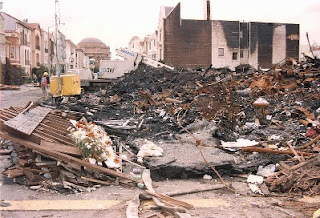 Santa Cruz and Watsonville also suffered major downtown damage. The historic brick buildings at the Pacific Garden Mall, a popular gathering area in downtown Santa Cruz, partially collapsed, causing three deaths. A Watsonville man died when his car hit horses escaping from a damaged enclosure. Other businesses were closed for for clean up and repairs. 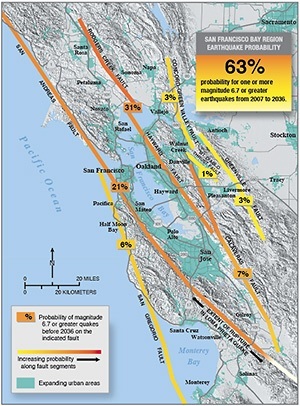 The quake had a huge impact on the Peninsula and coastal economy, which had been in recovery after a 1980 recession, an oil and energy crisis and double-digit inflation. 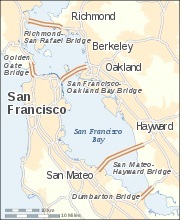 How safe are Bay Area bridges? Are we willing to invest in structural safety? Since 1989, voters missed some opportunities to adopt measures designed to retrofit our Bay Area bridges, voting some measures down during elections due to increased tax costs to homeowners. 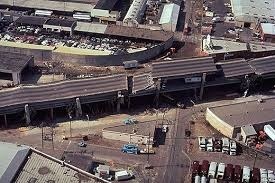 Many of our roads and overpasses need seismic and structural updating, however, there is even less funding now than there was back in 1989, due to the mortgage banking products collapse of 2008, which decimated cities and counties. Could it be time for a preemptive strike in the form of a second Bay Area Earthquake Relief concert, but this time held long before the next Big One hits for needed infrastructure and safety upgrades and repairs? Sadly, Bill Graham and Bob Hope are no longer with us. KQED remains robust and committed, still able to apply for another FCC waiver in the event of a second Bay Area catastrophe. KQED is geared for telethons using their large Mary Bole Hatch production studio, existing phone banks, and talented, experienced staff who already work with the public (and international and local talent) while organizing large, charitable-giving events. 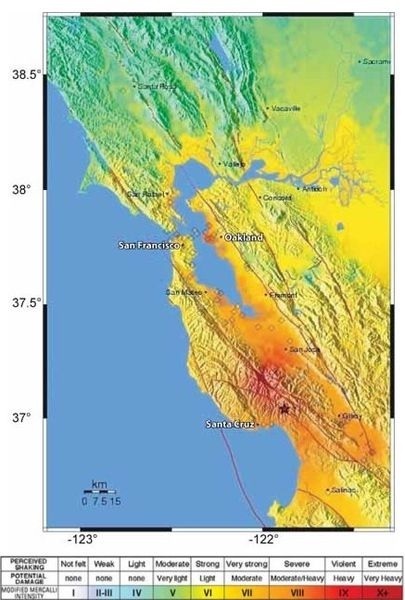 However, we now also have the social media stars of Silicon Valley (Facebook, Google, Apple, and others) who have the capability to develop and fund Bay Area 'Virtual Relief" events immediately, long before (or soon after) the next "Big One" hits. The generosity of Bill Graham and the stars of Earthquake Relief in 1989 live on in the high tech boardrooms of Silicon Valley, where many do not remember 1989 and it's devastation of this region, yet know the impact of recent natural tragedies in Oklahoma and on the East Coast, as well as overseas in Japan, Haiti, and in other world regions. Could we do it differently this time? Raise the needed funds now to improve infrastructure repairs and seismic retrofits for the safety of our communities, schools, and businesses, and as a result, save more Bay Area lives? According to a report by Stanford's Center on Philanthropy and Civic Society, philanthropic giving in Silicon Valley has a "weak philanthropic base" in terms of giving to local communities. Many of the donated funds from valley high tech firms, the Stanford PAC reports, are earmarked for overseas charitable work, not for infrastructure and social programs needed here in Silicon Valley or in the Bay Area. 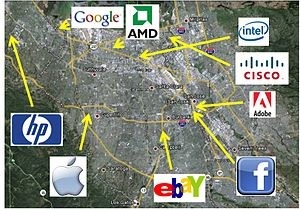 Stanford's position is refuted by the Wall Street Journal article, "The Tech Moguls That Gave Big in 2012." WSJ reported that SV "moguls" donated stock to local charitable groups in greater amounts than in previous years. The Foundation Center proposed that high tech donors really feared that a federal charitable deduction benefit would be lost in 2013, which artificially escalated the amount of high tech charitable giving in the Valley towards the end of 2012. A Forbes article, "How Silicon Valley Profits from Giving Back," talks about our local philanthropy as a result of sharing abundance, rather than seeking future returns. Forbes implies that Silicon Valley donors are more engaged in sharing their success to empower others. Clearly, Silicon Valley is a source of conjecture as a new model of wealth, with a unique, global approach to charitable giving and philanthropy. Personally, I believe our high tech community is populated with generous people who believe in lifting others up and expanding local safety, since obviously, they live here too. Hopefully, our amazing Silicon Valley philanthropists will continue to dig deep for our communities, yet stay off our local bridges, roads and overpasses, until they can successfully lobby our local transportation agencies to have these structures repaired. A major social media and funding campaign to raise awareness and capital, so repairs can be made sooner, rather than later, would be awesome. Like us, their families, friends and co-workers may be injured or trapped in structures now known to be compromised. Is infrastructure the job of Silicon Valley? No, not really. However, Katrina, Hurricane Sandy, and many of the other natural disasters had Silicon Valley responding with generosity and compassion. Perhaps we are in denial about our own elephant in the living room, which is the sad state of our historic and public buildings, schools, bridges, roads, and overpasses, in light of the 63% statistical certainty that the next big earthquake may take place within the next 30 years here in the Bay Area (according to the USGS). 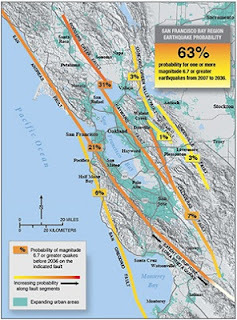 Perhaps we need to stop throwing peanuts at that elephant and lift the seemingly rampant denial about our lack of safety while traveling throughout Silicon Valley and the Bay Area, by doing something meaningful about it now, to significantly lower the number of potential deaths and injuries during the next seismic event. 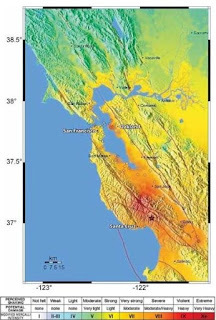 (Photos courtesy of Wikipedia Commons, KQED, SF GATE, ABAG, Forbes, and the USGS Loma Prieta page.) Many thanks to the Silicon Valley Foundation and other groups who help connect Silicon Valley leaders with those in need from our communities. Santa Clara and Alameda Counties shared an exposition hall at the 1915 PPIE held in San Francisco, near what is now the Marina District. Sadly, an image or more information about the hall and its contents are very hard to locate, but the hall is mentioned in catalogs from the fair, although not in great detail. Television producer, Lee Mendelson, created a lovely video, The Innocent Fair, from 1915 Nitrate films he found in a Tiburon antique store. 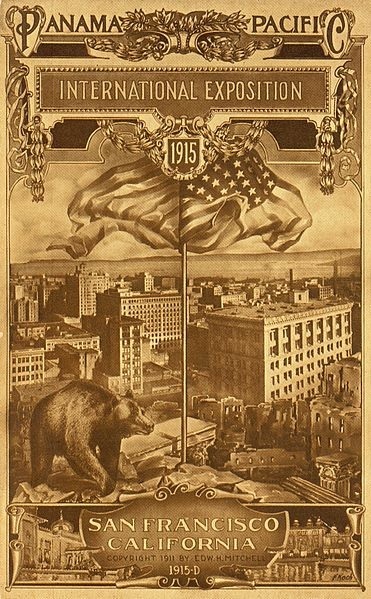 In honor of the coming 100th anniversary of the PPIE, I have added some information about the PPIE of 1915 on a new resource Page on this site, since the exposition, it's planning, and it's world-wide advertising from the time the City won the fair location bid in 1911, brought an influx of new visitors and residents to Santa Clara Valley after the devastation of the 1906 Earthquake, which had discouraged investments, building and tourism in this region. 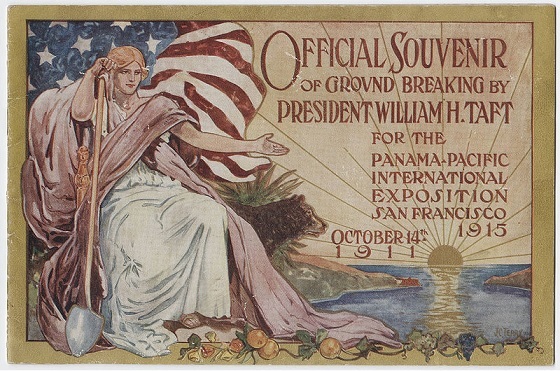 The PPIE celebrated the completion of the Panama Canal and new routes to join the East and West, without the long trip around South America. 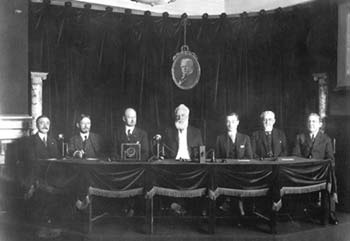 The PPIE also demonstrated a new transcontinental telephone line when Alexander Graham Bell made the first bi-coastal telephone call from an exposition hall. 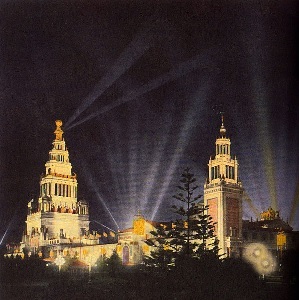 A lighted and sparkling "Tower of Jewels" enthralled exposition visitors and could be seen for miles from the waterfront and on the north end of the City. The "Novagems" from that tower are now a highly sought-after collectors item. The true value of the PPIE of 1915 to our valley and to the City was demonstrating to the world that we had healed from the fires and devastation of 1906. The PPIE declared that we were once again a safe location for world tourism and investments. 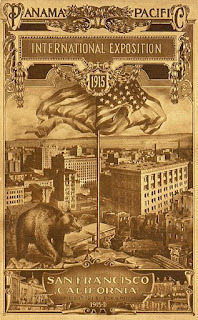 Please see my new PPIE of 1915 resource Page to the right for more information and resources on this remarkable event.